What time did you get up this morning? 5:49 a.m..
What was the last film you saw at the cinema? "The DaVinci Code"
What is your favorite TV show? "CSI"
If you could live anywhere in the world where would it be? Some where it is warm but not hot, cool but not cold. Favorite Place to Eat? I don't have one favorite! Where would you want to retire? retire? what is that. Always wear your seat belt? Yes, always now! Been in a car accident? Yes, two times. Both times I was hit by another car. How many times did you fail your driver’s test? Once. What was your favorite vacation? Florida. Last person you went out to dinner with? Mary. What are you listening to right now? Machines, people typing, talking, coughing. How many tattoos do you have? one. Coffee Drinker? Yes, cream 2 sugars, hot or cold. 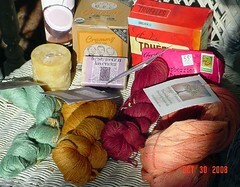 Cyndi at the Yarn and Fiber company is running a month long sale to celebrate October and the Salem Witch Trials. As many people know the Salem Witch trials took place in 1692 here in Salem Mass. Around this time of the year lots of people flock to this area to see the place where they hanged the "witches". Cyndi is telling the story in daily snippets and also putting different yarns on sale every day at 12:00 noon (although maybe it should have been 12 midnight, the witching hour). Check it out and you might even see a blurb about yours truly and my ancestor Susannah Martin. 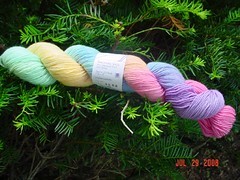 new on line yarn store. She has some fab prizes available. Contest is open until July 31. Here is her blog. Good luck and may the best person win (that would be me). Have a great day! Found this over at Jeune's blog. Thought it looked like fun so here goes. You should try it. It is pretty interesting. I feel like having a contest. Read on to find out what it entails. On Saturday Mary and Cheryl put up the Christmas tree while I was at work. It is a fake one (with 4 cats it is safer) that already has lights on it. Sunday night we were all home so we had the kids decorate it. Now Cheryl has Christmas ornaments, I have ornaments and even Mary has at least one ornament so the kids had quite a few to choose from. One of our family’s traditions is that we hang a Santa bell on the tree every year and this year was no exception. Every year a different child/adult has the responsibility to put the bell on. It is a small metal bell that has been around since my mom was little. Supposedly when Santa arrives, he rings the bell. Many a child has claimed to have heard it while they were sleeping, myself included. When I grew up and moved out of my grandmother’s house, we had a small bell that we put on our Christmas tree and when my kids were born, I continued the tradition as did my sister. Now that we all live together, we use the original bell. Do you have a tradition/ritual that was started when you were little or when your parents were little that you have continued? Leave me a comment telling me a little bit about it, or post it on your blog and let me know and I will put everyone’s name into a hat and you will get a little goodie bag with some hand dyed yarn and other knitting type items. Contest ends December 21st at midnight. Last week I received my final SP11 gift. OMG I can not believe what wonderful things were inside this box. First there was a great little package of lace weight yarn in Grape and a pattern to go with it. Then there was a sweet short sleeved sweater pattern for me to try once again to knit a sweater. Some lovely tea and the ABSOLUTELY BESTEST gift of all, not one but two pieces of black amethyst glass, a small vase and a beautiful bowl. 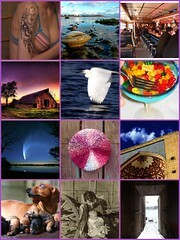 My SP was Lori Bell of http://littlebeadedacorn.typepad.com fame. THANK YOU SO MUCH LORI. These items are so appreciated. She did a fab job as a secret pal. I never expected the glass, never in a million years. My sister saw this pattern posted on NHknittingMama web site and decided to give it a go. (She is running a contest, check it out) Since Cheryl doesn't like dpns and we didn't have a long enough/big enough magic loop, she did it on straights. (check out hers) I like the way it looked so much that I decided to try it myself. Very easy pattern to follow and very easy to adapt. I added the funky yarn on the top that I received from a swap-bot pal from France (thanks) and changed the bottom around a little so that it sat more flat. Here I decided to dress up my wine bottle with it. Enjoy.